Do me a favour: Click on the image on the left of this post and tell me the price of a large Mexican Hot pizza from Dominos and reply to this post with the price. Why am I asking such a strange question? Because I for one have no idea how much it costs and I’ve looked at the menu for a good ten minutes since recieving it through through my letterbox. I know how much an Original Cheese & Tomato pizza costs and I know how much it would be to create my own pizza. 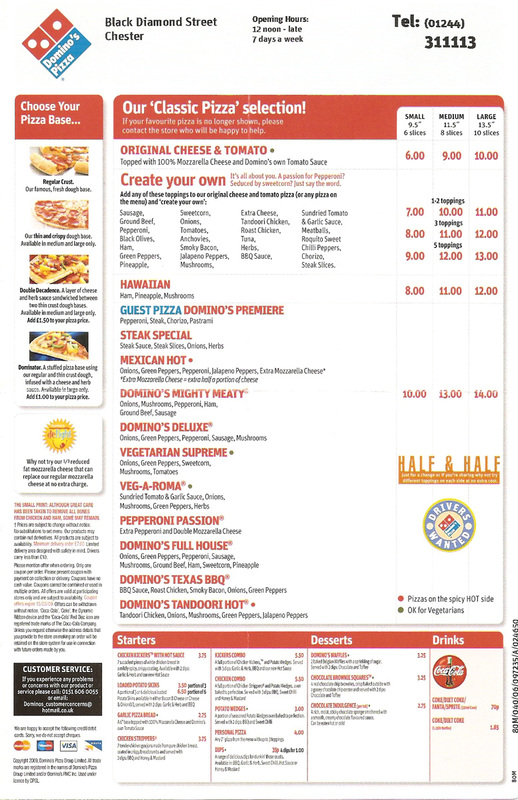 I also know how much a Mighty Meaty pizza costs, just one item down below Mexican Hot, but I’ve no idea how much the Mexican Hot pizza and the other pizzas on there cost. Why? Because there’s no easily identifiable price for them. I’m hoping that I’m not going crazy and you’re just as confused as I am with this menu. I find it strange that such a large and popular company would not go to every effort to make sure that I understand how much something costs before ordering it. It wouldn’t be hard to add the prices for each separate pizza and yet they’ve been omitted, creating a level of confusion that shouldn’t be there. If a customer doesn’t know the price of something, it makes the customer lack confidence and that will reduce the chance of them calling up and finding out over the phone. It’s an unnecessary barrier and one which could potentially lose you a customer because such a customer may simply decide to either go with a rival company or decide against purchasing anything at all. In order to capitalise on your market share, every effort should be made to make buying one of your products as easy as possible for the customer. If it’s not easy, your customers will get turned off and look elsewhere. Do let me know if I’m wrong on this.